Tenders are invited for disposal services for construction/demolition materials generated within Hawkesbury City Council Local Government Area and will be received up to 3pm on Wednesday, 19 December 2018. The purpose of this tender is to obtain disposal costs of excavated and demolition materials to landfills and/or other waste management facilities nominated by the Tenderer. 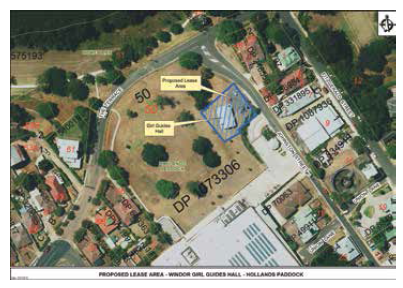 Proposed 21 year licence with Girl Guides NSW & ACT for use of a portion of Hollands Paddock, The Terrace, Windsor. Hawkesbury City Council is intending to grant a 21 year licence to Girl Guides NSW & ACT for a portion of Hollands Paddock as outlined in the below diagram. Girl Guides NSW & ACT is intending to use the land for the purpose of operating a guide hall and associated activities. For more information refer to Council’s website www.hawkesbury.nsw.gov.au and click on the “Community Consultation” link. Any comments about this proposal may contain information that is personal, such as information that identifies you for the purposes of the Privacy & Personal Information Protection Act 1998. The submission of personal information with your comments is voluntary but, if not provided, may effect consideration of such comments. The purpose of collecting this information is to assist Council is obtaining the views of the residents. This information will be stored in Council’s records system and may be made available to third parties in accordance with legislation.